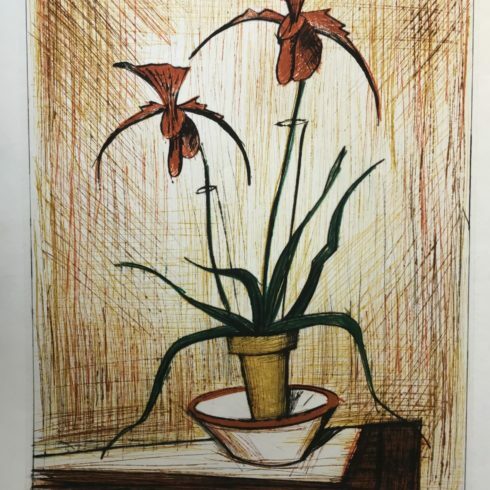 Bernard Buffet, Marguerites Rouges (Red Daisies) is an original lithograph in colors printed in 1983. It is signed and annotated “E.A.” Sorlier 422. 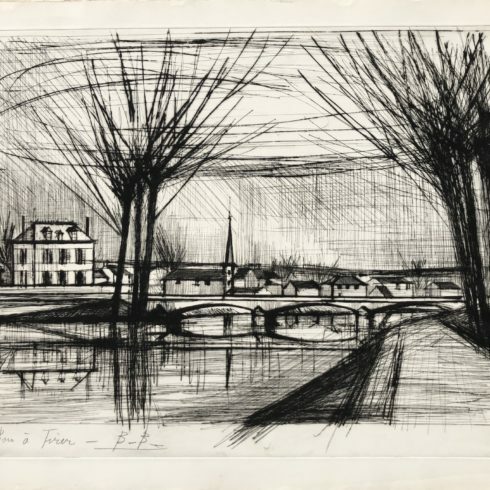 Born in Paris on 10 July 1928, Bernard Buffet was a painter, lithographer, and etcher who studied at the Paris École des Beaux-Arts and gained early critical acclaim and fortune through his prolific output – he painted more than 8,000 works in his lifetime – and immediately recognizable stylistic manner. Active during a time when abstraction was the predominant artistic style, Buffet defended representational art and was an active member of the anti-abstraction group L’homme Témoin (The Witness-Man). 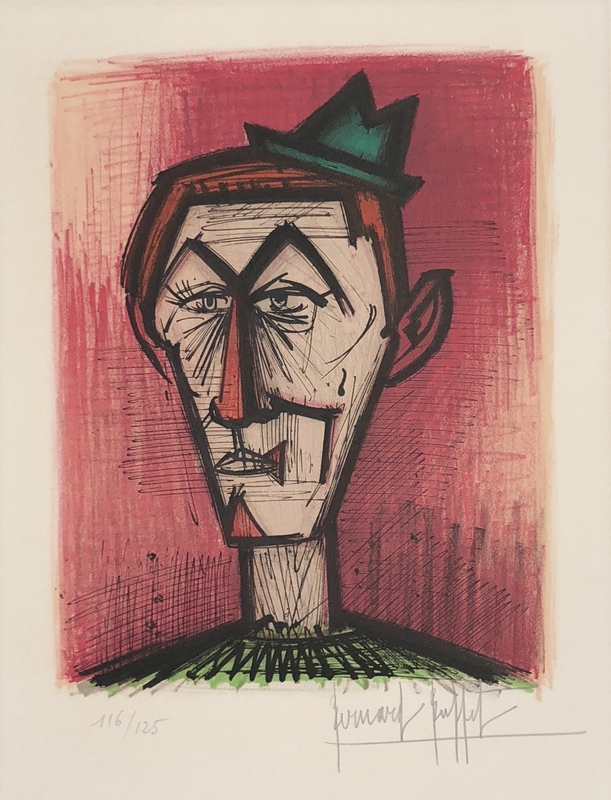 Featuring portraiture, townscapes, still lifes, and historical and religious subjects, Buffet’s oeuvre is primarily graphic, with spiky, angular and elongated forms rendered in a somber color palette. 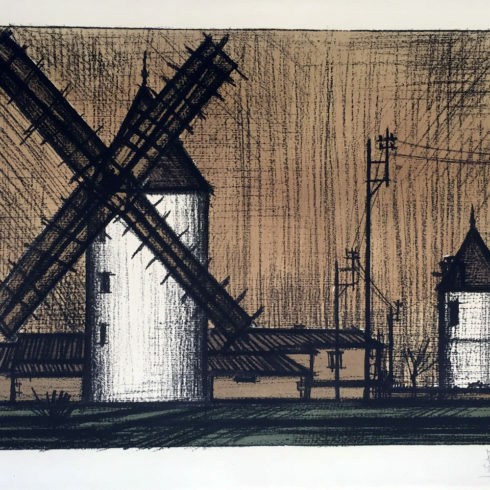 This stylistic mode gives his work an austere and melancholic tone that has been interpreted as a representation of the emotional state of the post-war generation. 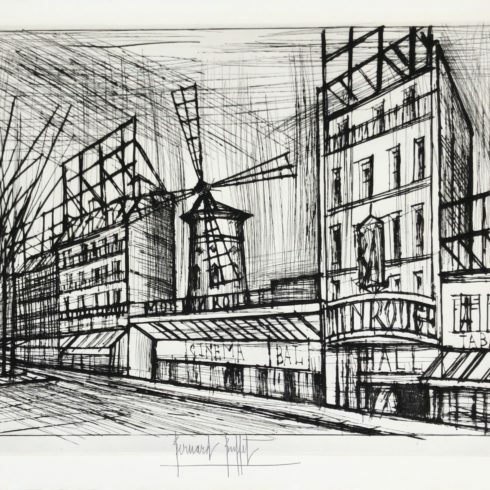 Buffet has had dozens of international exhibitions and was awarded a number of prestigious honors, including being made an Officer of the Légion d’Honneur in 1973 and being inducted into the Académie des Beaux-Arts in 1974. 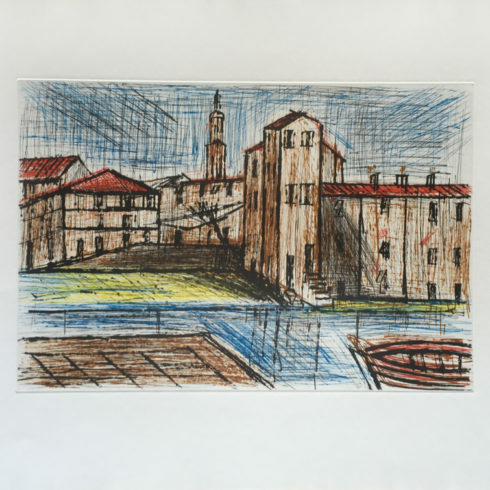 Unfortunately, the end of his life was marked by a prolonged battle with Parkinson’s disease, which resulted in the artist committing suicide at the age of 71 on 4 October 1999. 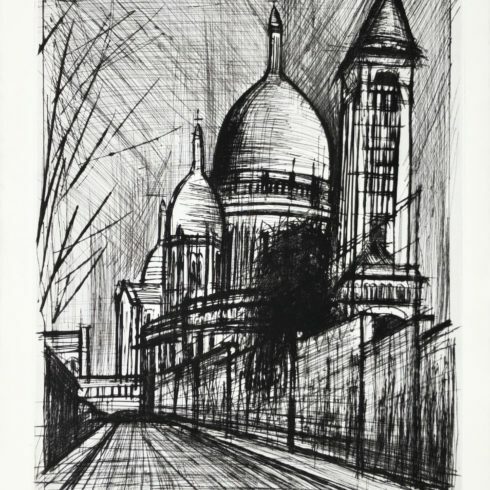 The work of Buffet has remained consistently popular, and his paintings have come to be housed in some of the most notable museums around the world, including the Tate Modern, London, Museum of Modern Art, New York, and a dedicated collection at the Bernard Buffet Museum in Japan. 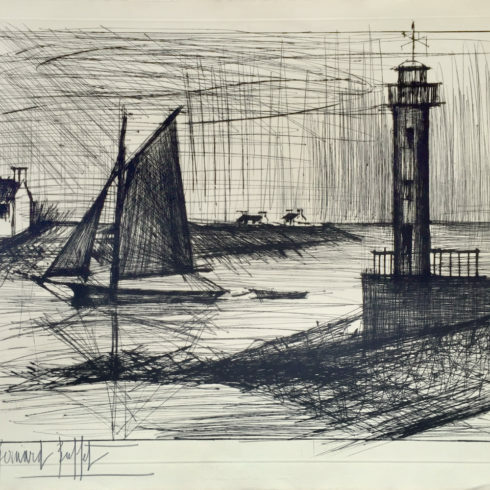 No doubt a result of his iconic style and continuous desirability, according to Sotheby’s Mei Moses the average compound annual return for Bernard Buffet is 9.9%, with 85.2% of works increasing in value.